I’ve had this link on my list of things to write about for a few days and even though it’s not the most compelling thing to write about right now, I wanted to make sure I wrote about it before it got to be too far away from the incident. 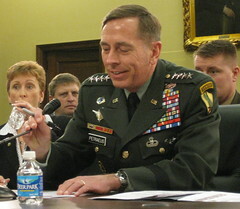 The link is a panel discussing the motives behind the Petraeus affair. While those are all plausible explanations, some carry more weight than others. Better yet, I think that there is an important one missing from this list: drive. While these are some helpful (in understanding) precursors to cheating, there’s still one more I want to discuss — personality. Yes, personality is named in this list, but I don’t think that it adequately gets to the point I’d like to make. Think about the kind of personality required to make it to the levels that Petraeus, Woods, and Bryant have. It takes quite a bit of discipline, dedication, and perseverance. These men didn’t just wake up one day at the pinnacle of their professions. They worked hard for it. While, of course, talent plays a big role in being able to make it to the upper-echelon, drive also plays a big part, too. It is this drive that I think plays a large part in infidelity. It’s almost as if we could theorize that there’s a triangle. 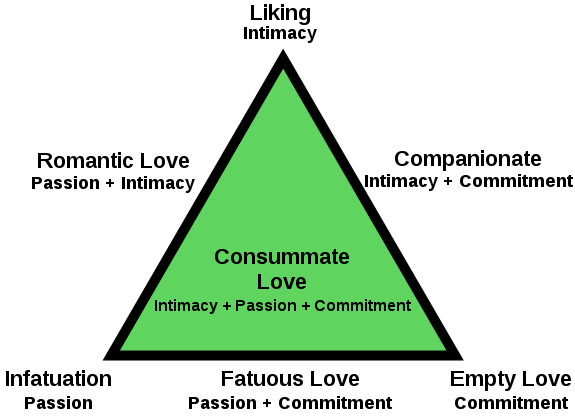 In fact, it reminds me of Sternberg’s triangular theory of love (pictured above-left). I would argue that drive is one of the vertices of a triangle, invincibility is another, and opportunity is the third. Without these three things present, one won’t necessarily cheat. Similarly, with these three vertices present, one won’t necessarily cheat. Though, when these three vertices are present, I would bet that the incidence of cheating is elevated. This entry was posted in News, Politics, Psychology, Science and tagged Central Intelligence Agency, Cheating, David Petraeus, Federal Bureau of Investigation, Infidelity, Kobe Bryant, Marriage, Petraeus, Tiger Woods, Woods. Bookmark the permalink. This website is run through WordPress.com, so none of ads are mine.